Published: Oct. 29, 2015 at 07:51 p.m.
We've just about reached the midway point of the NFL season, but for fantasy enthusiasts, the race to the playoffs is on. That means you're taking stock of which players are rising and which ones are falling. As always, the Fantasy Stock Watch is here to help and offer our take on which players are adding or subtracting value. Tight end continues to be the most vexing position in all of fantasy football. Just when we think we've found a player we can cling to -- like Charles Clay -- someone like Chris Gragg comes into our lives and makes us rethink everything we thought we knew. Now we wait to see if this is the new way of things in Buffalo or if the Bills just got a good rate of exchange with Gragg in London. Regardless, we're back to the waiver wire looking for tight end help once again. We've been here before. Because of an unfortunate injury to Arian Foster, Alfred Blue is once again in the spotlight. There's a solid chance that Houston goes with a committee system that gives touches to Chris Polk, but Blue is going to be the lead back in this rotation. Neither rusher is going to match Foster's production, but if you're needing running back help then you might want to start here. 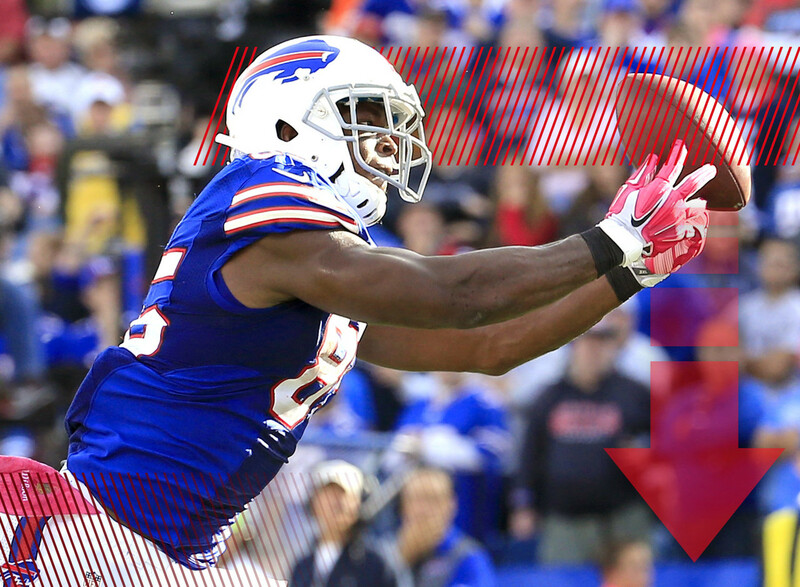 Orleans Darkwa led the team in carries last week and scored New York's only offensive touchdown. Let me say that again. Orleans. Darkwa. If that isn't a harbinger of doom for Jennings' fantasy prospects, I don't know what is. Big Blue's three-headed running back monster has now grown another head which just means one more mouth to feed. If you haven't run screaming from this backfield situation, now's a pretty good time. Johnson's hot start to the season has been one of the biggest stories of the NFL (and fantasy) football season. Bruce Arians has remained true to his word that he is going to use a workhorse back and the veteran has taken the role and run with it ... literally. Don't believe me? Go see who is the NFL's second-leading rusher. I'll wait. Got it? Okay, well this week's matchup against a horrid Browns run defense makes an already good RB start a great RB start. Carlos Hyde has become what he feared -- a two-down back in a bad offense. Because of the dearth of rushers on the waiver wire, it's hard to drop a guy who starts every week and leads his team in carries. But you're not playign him every week. The tough part is that the 49ers might not have a lot of positive matchups left for the rest of the season. Hyde's value is sinking like a cement-covered stone. Charcandrick West's last three weeks has been a study in patience -- or lack thereof. After a lackluster first week as Kansas City's starter, he was dropped in nearly all fantasy leagues. After he exploded in his second week, the race was once again on to add him. We've been over this before ... West isn't going to replace Arian Foster's production, but he is a starting running back in the NFL receiving the bulk of his team's carries. That alone makes him worth a roster spot. Remember a few weeks ago when Willie Snead was the hottest thing going in New Orleans and the talk of fantasy football? Man, those were good times. In the past two weeks, Snead has a combined seven catches for 70 yards. It's encouraging that he gets to face a porous Giants secondary this week, but this Saints passing game is just too inconsistent for fantasy managers to rely on week-in and week-out. It took a while for Floyd to get going, but in the past two weeks he's made a fantasy impact with a couple of touchdowns. It's been disappointing to watch him go from being a No. 1 option a couple of seasons ago to now being the No. 3 receiver in Arizona. The upside is that Floyd plays in one of the league's more potent passing games and is starting to see red zone targets. His overall target number could increase if John Brown doesn't play in Week 8. Why do bad things happen to good running backs? I wish I had an answer for you, Alfred Morris. You deserve better. Unfortunately your head coach seems to have a grudge against you. Did you hand out peanut butter cups to his kids last Halloween? I'm searching for answers. Until I find them, I have to downgrade your fantasy value. I'm not happy about it, but it's what I've gotta do. I'm sorry, Alfred. At least it's not all doom and gloom in our nation's capital. Since returning from injury, Jordan Reed has reassumed his place atop the Washington passing pecking order. As the team waits for DeSean Jackson to return from injury (who knows when that will be?) Reed is likely to remain the apple of Kirk Cousins' eye. You like that? You like that? !